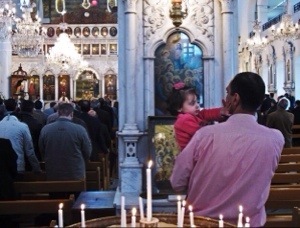 DAMASCUS (AP) – Syrian Christians offered prayers Sunday for a group of more than a dozen nuns and orphanage workers held by rebels for nearly a week, fueling fears in the minority community that they are being targeted by extremists among the fighters seeking to oust President Bashar Assad. The seizure of the 12 Greek Orthodox nuns and at least three other women is the latest attack to spark panic among Syria’s Christians over the strength of al-Qaida-linked militants and other Islamic radicals in the nearly 3-year-old revolt against Assad’s government. A priest and two bishops previously kidnapped by rebels remain missing, and extremists are accused of vandalizing churches in areas they have captured…. And our president is supporting these terrorists with our tax dollars!